and quite enjoying making Maftool for her family. Moughrabiyeh stew can be served on top of rice, cracked wheat or couscous (Algerian style – see note below), or over Moughrabiyeh beads (Maftool). If you are willing to invest 2-3 hours in the preparation of the beads then go ahead. My advice is to make the beads on a leisurely day when you don’t have much to do. Freeze the beads in an airtight container and use them whenever you wish to prepare the meal. 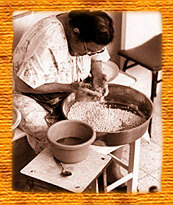 In the Middle East, only a small percentage of women venture into making the Maftool beads, (by the way, maftool means spun-around or rolled-around) and even a smaller number are successful at producing beads that are uniform in size. Beads can now be purchased in packages in Middle Eastern specialty stores. Following are the directions on how to cook the stew and how to make and cook the beads. Fry chicken in oil until browned. Remove to a bowl. Fry onion slices until golden brown. Drain chick peas and add to onions. Cook for a minute or two. Add chicken, salt and spices, and cover completely with water. Bring to a boil. Lower heat and simmer covered, until chicken is tender (about 30 minutes). Add lemon juice. Serve over rice, cooked cracked wheat, couscous or with Maftoul. In a small bowl, soak cracked wheat in a bit of water for 15 to 20 minutes. Sift flour until about 125 mL (1/2 cup) is left in the sifter – discard the brownish bran (or save it for another use). Place 500 L (2 cups) water in a bowl; add salt and vegetable oil. Place the tray, the bowl of water mixture and the flour on a working area which is slightly lower than the chair you’ll be sitting on. Squeeze excess water from the cracked wheat and spread the bits over the surface of the tray. Sprinkle with 20 mL (4 tsp) flour and mix carefully to prevent the bits from sticking to one another. With both hands pressed firmly over the bits start rotating your hands in one direction. The idea is to coat the cracked wheat with the flour. When this is done, sprinkle with 10 mL (2 tsp) of the water and oil mixture. Rotate your hands again. Give them a sprinkling of flour and rotate. Repeat until the beads are the size of chick peas. This job needs patience and persistence. Dab beads with butter and stir. Pour beads into the pot and cook over very low heat for another 20 minutes. If the mixture becomes too thick, add more sauce. Spoon into serving bowls. Top with a piece of chicken and more sauce. It will have the consistency of a thin stew. Squeeze more lemon if desired. Note 1: As mentioned above, Algerian style Moughrabiyeh is served on top of cracked wheat or couscous beads. In addition, chopped celery, carrot, tomato is added to the stew, giving the meal a twist in taste and colour. Note 2: Don’t let the seemingly overwhelming bead project deter you from preparing this meal. It is quite delicious served with rice! Note 3: If you are ever in the Middle East, speak of this recipe by its MOUGHRABIYEH name and not by its Couscous name. Couscous in Arabic has a very naughty connotation which I will not get into here.